PLACE potatoes in massive saucepan. Cover with water; convey to a boil. Cook over medium-high warmness for 15 to 20 mins or until tender; drain. PREHEAT oven to 350° F. Grease 2 half- to 3-quart casserole dish. RETURN potatoes to saucepan; upload evaporated milk, sour cream, salt and pepper. Beat with hand held mixer till smooth. Stir in 1 1/2 cups cheese and 1/2 of bacon. Spoon mixture into organized casserole dish. BAKE for 20 to twenty-five minutes or till heated through. Top with ultimate 1/2 cup cheese, closing bacon and green onions. Bake for an additional three minutes or till cheese is melted. This casserole may be assembled in advance of time and refrigerated. Cover with foil and bake at 350° F for forty to 45 minutes or till heated. 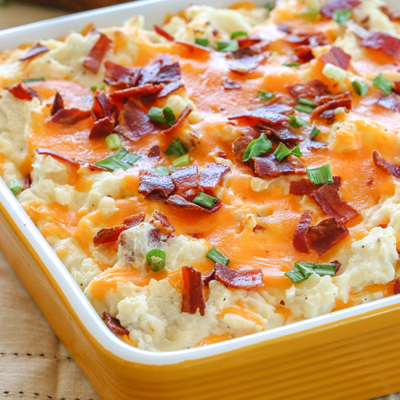 Uncover; top with cheese, bacon and green onions; bake for an additional three mins or until cheese is melted.